The month of August has sadly arrived. I say sadly because it means that summer is unfortunately coming to an end. I was only getting used to the beautiful weather we’ve been having here in Vancouver! That is why I have not been blogging in awhile. The sunshine is just too gorgeous not to be enjoying it! – This is part of Clinique’s 3 Step Skin Care System and apparently this is considered new because of its new formula, hence the “+” at the end of the name. This is for very dry to dry combination skin, which I do not have so I will have to give this away. – I am a lip balm kind of girl, so this product will come in handy. Upon testing it on my hand, there is no harsh smell or anything and I like that it has SPF to protect your lips from sun and extreme temperatures. 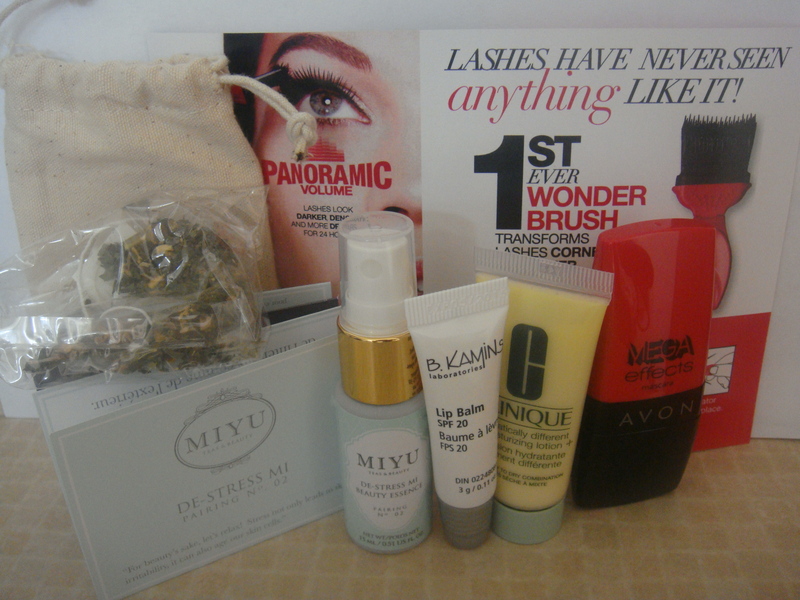 – Included in the box was a description card of this new mascara from Avon. The card shows you how to use this mascara as the brush looks like a paintbrush and may confuse you if you try to figure out how to use it on your own. I already have a stash of mascaras that need to be used, so unfortunately I plan on giving this away. Overall, I will enjoy 2 out of the 4 products. I have seen pictures of what other subscribers have received this month and it seems that some unfortunately received recycled products from past boxes. Not a good thing! I am still pondering if I should stick with Topbox a little longer or try something new. Definitely :) Thanks for stopping by! I received the same box and was very disappointed. The lip balm leaves a white cast on my lips, too. I cancelled my subscription this month. Really?! I have yet to try the lip balm. I’m still debating on cancelling.. Thanks for the heads up! I cancelled topbox a few months ago, but I love the Miyu stuff! I got to try it out at the Beauty Boards event in Toronto a few months ago (before they launched) and it was really nice! The tea is super yummy! I’m so interested to hear reviews of the Avon mascara too. Oh awesome! I am excited to try the face mist out and will save the tea for a cold night. I have too many mascaras so I will need to give this Avon one away!